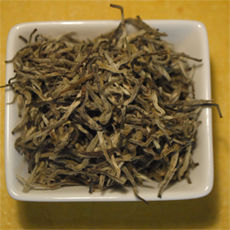 Darjeeling Silver Needle White Tea: These are made purely from tea buds, and are considered as the champagne of teas. These are available in packs of 50 Gms and 25 Gms. These teas are to be used 4 times. You can buy these teas on our online store. White tea is the purest and least processed of all teas. It has the least amount of caffeine and the highest amount of antioxidants of the three main types of tea. The process of production of white tea maximizes its health benefits and ensures that white tea maintains its freshness. The major difference between White tea and other types of tea comes from the part of the plant that is used in production. Most white teas come from the leaves and the buds of the tea plant at the branch tips, whereas other teas come from the upper leaves of the plant. In addition, the buds and leaves used in the production of White teas are picked during a limited period every year. Because of this reason white tea is much more scarce than other types of tea and is more expensive too, up to three times as expensive as green tea for the best qualities. But at the same time less white tea is needed to get a fresh and strong infusion of antioxidants that strengthens the immune system and the body. Moreover, only a little amount of white tea leaves can be used multiple times to make several cups. How did White tea get its name? Unlike other teas, the tea leaves for white tea are harvested before they are fully open. In this state, the buds are covered by white hair which is what gives this tea its name. Only certain leaves are selected, with the ideal being two leaves wrapped around a new shoot. White tea unlike green tea does not contain the chlorophyll containing leaves responsible for a bitter taste as it is made of young shoots. A minimalist approach to processing gives white tea a much gentler and subtler taste. It may take some time for people to develop a taste for this finer, understated tea, but once hooked, no other tea will do. Those who don't like the slightly grassy aftertaste of green tea find it easier to develop a taste for this tea. Studies have shown that white tea has a concentration of antioxidants that is three times higher than in green tea. Essentially, white tea contains the same concentration of antioxidants as the young and fresh tea leaf buds that are still attached to the bush. This makes white tea the tea with the highest antioxidant content, and a more pronounced effect on cancer, stroke prevention, cholesterol control, aging and general wellbeing. In medical sciences the benefits of antioxidants in disease-prevention is well documented and proven. Studies have indicated that white tea may be helpful in halting the growth of bacteria that cause pneumonia, dental problems and other infections and it is shown to be even more effective than green tea in inactivating viruses. White tea can stimulate the immune system to fight disease. It can also prevent diseases from occurring, by halting their progress in the early stages.